Let's face it, it ain't cheap to get a decent photo with the man in red these days, and more often than not your offspring will freak out at the very sight of the old fella. So why waste your money? Here are some ideas where you can get a photo with the bearded one for free! For kids and pets - have your puppy dog or kitty cat's pawtrait done too! You will receive one 6" x 8" printed photograph plus you will also receive a copy emailed to you. Santa and his elves will be boarding different ferries over this two day period and you can snap a selfie of you and the kids with Santa. If you upload it to facebook or instagram and tag #sydxmas and #beyondthewharf your photo can be printed out instantly on board via a live Instagram printer! Santa and his missus will be roaming along the shopping district of Pitt St, so have the smart phone ready so that you can take a selfie with the kids. You will receive one free 6" x 4" per family. Make sure you check with your local store to make sure of the big fella's appearance times. To take a real Aussie type of Santa photo this year, why not head to Christmas by the Beach where you can snap a photo next to Santa with sand in between your toes, right on beautiful Dee Why Beach! Your photo will be uploaded to a special page where you can then download a high resolution copy and create what ever Christmas masterpiece you desire. This will probably be the highest spot in Sydney where you can snap a free photo with Santa (although you do have to pay the entrance fee to the Sydney Tower Eye). The observation deck is being transformed into Santa's Grotto complete with a Christmas Tree, festive music and even a fire place! 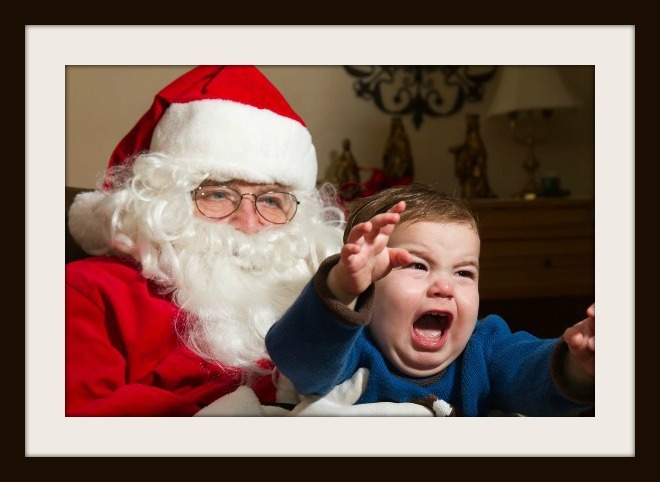 If your child is completely terrified of Santa then take a fake Santa photo this year. During Santa Fest at Darling Harbour, a 7m high Santa made out of milk crates will be available for you to take a selfie with - you might need the selfie stick to capture the whole tribe in perfectly! Now it's over to you readers - where else in your neighbourhood can we go to get a free photo of Santa?